For Refugees And Advocates, Trump Immigration Order Stay Leads To Disarray : Parallels Refugee advocates have hailed the ruling, but say the future of the resettlement program is uncertain because the court didn't address Trump's order to slash the number of refugees allowed in. HIAS, a Jewish group that supports refugee resettlement, held a rally against President Trump's immigration ban on Feb. 12 in New York City. The group worries that giving governors the power to veto arrivals — something President Trump wants to do that last week's court ruling did not address — could unravel the resettlement program. The 9th U.S. Circuit Court of Appeals judges did not address perhaps the most sweeping provision in the Trump order — the deep cuts in the numbers of refugees allowed to come to the U.S. President Trump slashed the refugee quota for fiscal year 2017 by more than half, to 50,000. In addition, the court did not rule on a provision that would make it easier for states and cities to veto refugee placements. "You don't need to have a moratorium to slow the refugee resettlement program to the point where it dries up and withers on the vine," says Bill Frelick, director of Human Rights Watch's refugee program. 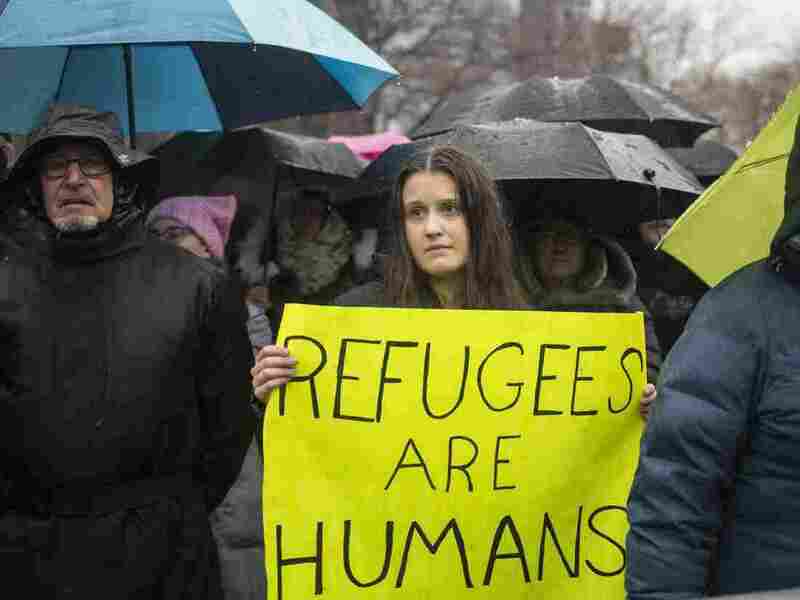 In the short term, refugee advocates have hailed the court ruling, which halted the Trump administration's 120-day pause in the refugee program and indefinite ban on Syrian refugees. More than 2,000 refugees, already vetted and approved for travel, have arrived since the ruling was handed down on Feb. 9. But over the weekend, according to refugee advocates who shared the official guidance with NPR, the State Department alerted resettlement agencies that new arrivals will end on March 3. "What you are going to have is a culture of saying no," warns Frelick. On the campaign trail, the president vilified refugees as agents for terrorism, but "there's no evidence actually to support that whatsoever," Frelick says. For decades, the refugee resettlement program has been a partnership between the State Department and nine private, voluntary agencies; all but two are faith-based groups. Together, they form a nationwide bureaucracy for resettlement. The State Department must first clear refugees for arrival. Then the voluntary agencies coordinate on-the-ground resettlement, meeting once a week to figure out which group will assist specific individuals or families, and where the refugees are likely to thrive. Placement depends in part on finding an existing immigrant community from the same country and people who share a refugee's cultural background, religion and language. There is extensive coordination with state and local officials, something required by federal law, says Saba Berhane, program director at the U.S. Committee for Refugees and Immigrants, one of the nine agencies. "We are required to consult quarterly," she says. The agencies also work with local officials so refugees can apply for social services. Denise Lamourex, the state refugee coordinator for Vermont — which has resettled more than 6,000 newcomers over 25 years through the federal program — told NPR via email that she meets often with "the voluntary agencies and the ethnic community-based organizations to coordinate services." Now, that coordination is in disarray. Berhane says the sheer numbers involved are daunting. "Once we start talking about adjusting the number from 110,000 to 50,000, it's not as simple as saying, 'Let's just switch a few numbers on a spreadsheet and call it a day,'" she says. Every day that passes without her group knowing what is happening, she says, increases the challenges that will emerge when refugees do arrive. The reduced arrival number will mean all the voluntary agencies will have to conduct a reassessment, says Mark Hetfield, president and CEO of the Jewish non-profit HIAS, another of the nine voluntary agencies. "We staff up for specific populations," he explains. "Syrians need Arabic speakers, Congolese need French speakers. It takes different cultural skills. It's difficult to change gears quickly." Despite a recent claim by Arkansas Gov. Asa Hutchinson, who said, "There's no information shared with the governor before a refugee is located in the state," Hetfield insists there is constant discussion between state coordinators and refugee agencies. "Any indication otherwise is false," he says. Hetfield worries that giving governors the power to veto arrivals, one of the things Trump wants to do that the 9th Circuit ruling did not address, could unravel the resettlement program. Trump has directed the Homeland Security secretary to "devise a proposal" to give state and local governments "great involvement in the process of determining the placement of refugees in their jurisdictions." Shifting the authority from the State Department to Homeland Security to place refugees in local communities "would be a new precedent," says Stephen Yale-Loehr, an immigration law professor at Cornell. "Many states have sued, saying they should not be required to admit refugees, but those lawsuits so far have failed in federal court," he says. In late 2015, after terrorist attacks in Paris, a majority of Republican governors vowed to block Syrian refugees from their states, but did not have the authority to stop the federal program. Vice President Mike Pence, then governor of Indiana, took his opposition a step further. Pence moved to block federal funds from the refugee program in Indiana. But a federal court barred the move. Late last year, the Seventh Circuit Court of Appeals upheld the decision ruling that Pence's action constituted discrimination based on national origin. "It would go against the federal role if states could say, 'Not in my backyard' and have veto power," says Yale-Loehr. At the same time, resettlement offices may have to downsize. The funding the State Department allocates to refugee resettlement agencies is based on the number of refugees each organization resettles. "We have people that are hired specifically as refugee case workers," says Mark Hetfield. "If no refugees are arriving and if we are not getting funding to employ them, then we have to let them go and we lose our infrastructure to resettle refugees. That's a huge issue."